We use a varied range of specialist repair mortars in our role as a dedicated concrete repairs contractor. 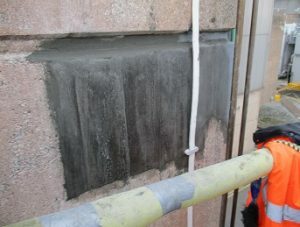 These include a range of sprayed concrete repair systems that are tailored to each specific concrete repair through investigation by our experienced staff. In untreated concrete, the process of carbonation is nearly impossible to avoid once exposed to the elements. Carbon dioxide slowly penetrates the surface of the concrete reacting to moisture and calcium hydroxide which is found in concrete. This forms calcium carbonate which initially hardens the concrete raising the compressive strength. Alkalinity then reduces in the concrete and it starts to breakdown. Depending on the permeability, concrete carbonation may advance at a rate of 1 – 5mm per year. As carbon dioxide travels deeper into the concrete it reaches the steel reinforcement embedded in the structure. As the concrete around the steel is broken down by carbonation the corrosive effects of the air and water rust the steel causing it to expand, spall and crack. This in turn causes a high rate of failure to the surrounding area. 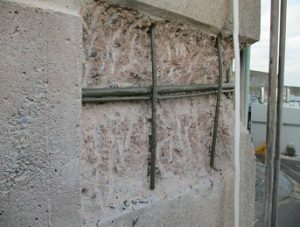 The concrete repairs contractor would cut out the area around the spalled steel, removing concrete back to sound substrate. The exposed steel would then be cleaned and prepared back to bright steel before treatment to protect it in the future. Depending on the scope of works, cathodic protection (corrosion protection system) might be used before the concrete repair mortar of choice is used to fill out the repair area. The surface area of the concrete structure can then be prepared by abrasive or water blasting and a fairing coat applied to bring the structure back to its original depth. Finally a waterproof coating is applied. The three images below show a typical concrete repair. The repair area is identified, marked and logged. The perimeter of the site is cut back to 10mm or until the steel reinforcement is encountered. The repair site is broken out and prepared. 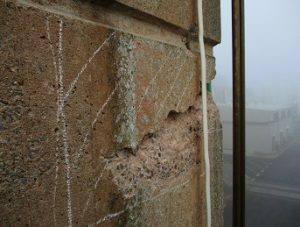 Steel reinforcement is primed and the repair reinstated with bonding primer and repair mortar, in line with product manufacturers technical data. All of CSC Services’ operatives undertake regular training on the repair and protection of reinforced Concrete Structures in accordance with BSEN1504 which is approved by the Institute of Concrete Technology. CSC Services are full members of the Concrete Repair Association, demonstrating competency and experience in concrete repairs. Our teams all have CSCS cards, EUSR Water cards, DOMS, Confined Space Certificates and are BSVR (Baseline Security Vetting Register) and CTC (counter terrorism check) vetted as a minimum. Read our latest article on protecting concrete tanks here. CSC Services provide refurbishment services and protective coatings to structures across the UK water sector, in nuclear power stations, public sector buildings such as hospitals and prison buildings, and across UK infrastructure including bridges, tunnels, culverts and sewers. Call us on 0191 410 3444 today for help or advice. CSC Services completed the 2017 and 2018 Concrete Spalling Remediation Programme at Hinkley Point B Power Station for client EDF Energy. Specialist repair mortars and structural strengthening products were used to rectify the degradation of reinforced concrete at various areas across the station. A combination of environmental exposure, water ingress and the age of the station building had caused spalling in areas including the flask bay and turbine hall. CSC Services have performed concrete repair work at Hartlepool and Dungeness Nuclear Power Stations for EDF Energy. 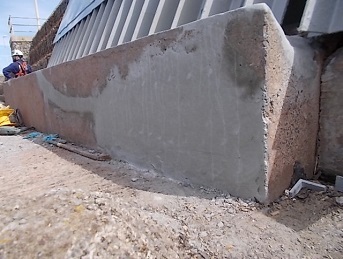 Concrete repairs were also undertaken at Hinkley Point B Power Station as part of a programme to refurbish the Gabion Wall in 2016 – as shown in image.